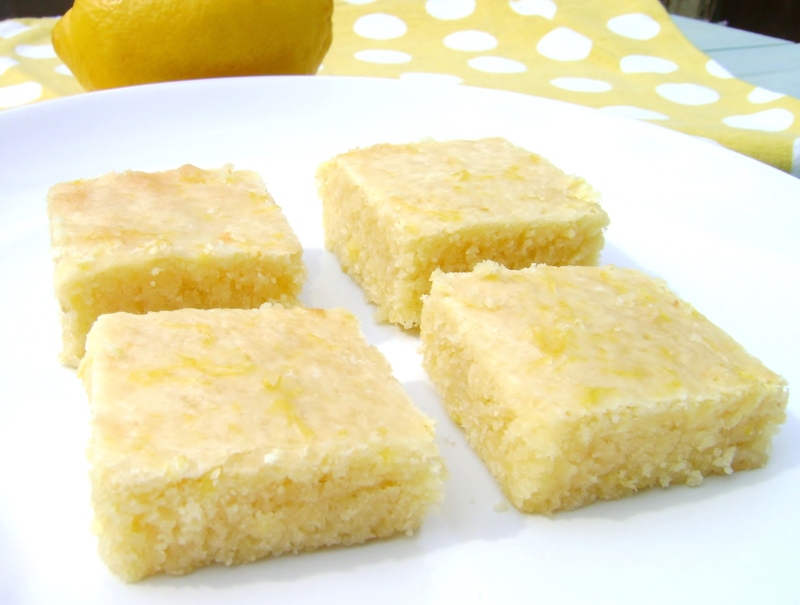 Lemon brownies, who knew? I recently came across them on Pinterest and couldn’t believe I had never heard of them! I love brownies and I love lemon, of course that would be a good combination, why hadn’t I thought of it before! All the recipes I found were in cups so I did a bit of converting, added a bit more lemon and made these to serve with coffee at Easter. They are so easy to make, I love cakes that come together quickly with the minimum of fuss and these certainly fit that bill. I think I like them even more than chocolate brownies and my husband who doesn’t like brownies at all (imagine!) loved these! They are moist yet light and the lemon is strong without been overpowering, these are my new go to cake! Well they will be when I bake again! I’m having a baking break at the moment, all that baking is not good for a girls waistband! Preheat your oven to 180C, 350F, Gas 4. Grease and base line your brownie pan, the pan I use measures 11 x 9 inches. Add the eggs, one a time mixing between additions. Fold the flour into the wet mixture. Pour into your prepared baking pan and bake for around 25 minutes until the top is golden and it is cooked through. To make the glaze simply mix the icing sugar with the lemon juice and zest. Spread the glaze over the brownie and cut into squares. This entry was posted on April 19, 2013, 11:22 and is filed under Baking. You can follow any responses to this entry through RSS 2.0. You can leave a response, or trackback from your own site. I’m glad I wasn’t the only one who hadn’t heard of them! They are so good, I wish I could have one now! Who knew indeed? 😉 They look lovely and make me think of spring. Your photo is spot-on with the pretty yellow! Love the polka dot napkin. I’m such a novice where photography is concerned, thanks for your lovely comment! I have never made these either Jayne! I’ll have to give these a go, my Andy doesn’t care for brownies either (I stil can’t get over that….). Wow another non brownie loving Andy, unbelievable! Wonder if he too would like the lemon ones? I LOVE lemon…these will be done and soon! “Yellowies” lol! They are good, let me know if you do make them! Wow, I can’t wait to put some of my Meyer lemons into this recipe! I thought they would be good with Meyer lemons! Alas no more available here but I will try when they return! Thank you for visiting my blog and commenting, conversions are such a pain aren’t they? Here are the conversions. A very creative & tasty recipe, I believe! Yum Yum yum!